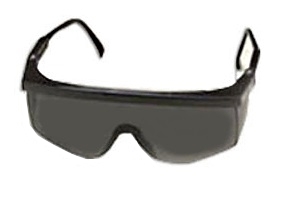 PRODUCT: STING-RAYS OVER GLASSES, ADJUSTABLE SAFETY GLASSES, BLACK FRAME WITH SMOKE BLACK LENS. Meets ANSI Z87.1. 12/PACK. PRICE/PACK. DESCRIPTION: Wrap-around design with adjustable length temples. Anti–fog hard coat polycarbonate lens had 99.9% UV protection. Meets ANSI Z87.1–1989 Economy, anti-fog and anti-scratch lens. Integral sideshields, brow and nose bridge - one piece construction for excellent comfort, strength and stability. Universal fit with 4-position adjustable temples. Fits over many regular glasses.